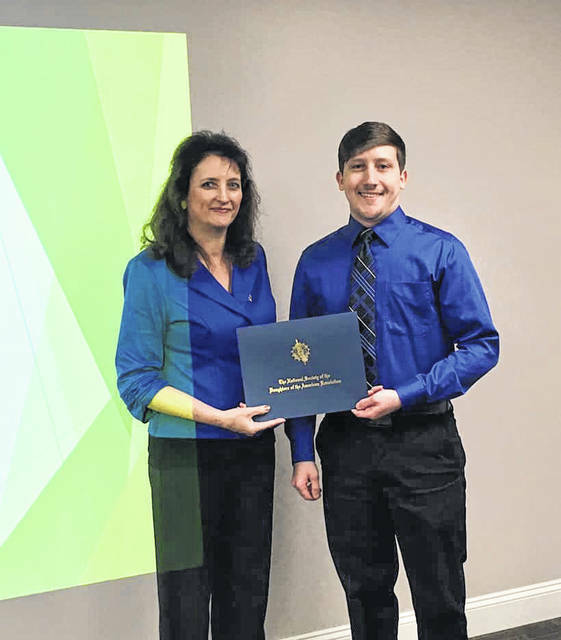 Return Jonathan Meigs Chapter Regent Gina Tillis presents a certificate of appreciation to Tyler Eblin, President of Friends of Rutland. Return Jonathan Meigs Chapter Regent Gina Tillis presents a certificate of appreciation to Sarah Hawley, managing editor of The Daily Sentinel. 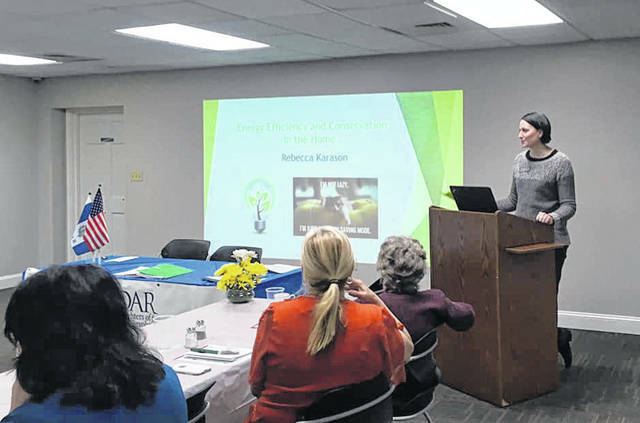 The program for the March meeting was presented by Rebecca Karason from Huntington National Bank talking about energy conservation. Opal Grueser is pictured with items which are part of the group’s project to send boxes to service members. POMEROY — The Return Jonathan Meigs Chapter of the National Society of the Daughters of the American Revolution held their 111th anniversary luncheon and celebration recently. The Return Jonathan Meigs Chapter began Feb. 8, 1908, in Pomeroy, at the home of Mrs. Mary Daniels Plantz when a group of women met to organize a local Daughters of the American Revolution chapter. The chapter received its name from Return Jonathan Meigs, son of Jonathan Meigs, a hero in the Revolutionary War and one of the earliest settlers in Ohio. Meigs County is also named for him. Patriotic — To cherish, maintain and extend the institutions of American freedom, to foster true patriotism and love of country, and to aid in securing for mankind all the blessings of liberty. As part of the annual celebration, the chapter recognized three individuals/groups for their contributions to the community. Recognized were Tyler Eblin, representing Friend of Rutland; Sarah Hawley, managing editor of The Daily Sentinel; and Jim Freeman from Meigs Soil and Water Conservation District. Chapter Regent Gina Tillis read information about each before presenting certificates to the recipients. Hawley was recognized for her work in local media in covering DAR stories and community events. Freeman was recognized for promoting conservation of Meigs County lands and local wildlife through thoughtful programs administered through Meigs Soil and Water. Eblin and Friends of Rutland were recognized for promoting patriotism by obtaining and flying the flag of the United States in the village of Rutland, along with other community service projects. Freeman was unable to attend the event. Following the meal and presentation of certificates, the program on energy conservation was presented by Rebecca Karason who works in energy conservation for Huntington Bank. The DAR is a national women’s service organization, and the local chapter is involved in both community and national service projects. The local chapter has collected items and hand-made children’s cards to fill care boxes for deployed soldiers stationed overseas. “One of the best ways to help support deployed troops and raise morale is to send a care package — a box packed with items from home that may be difficult to acquire overseas. 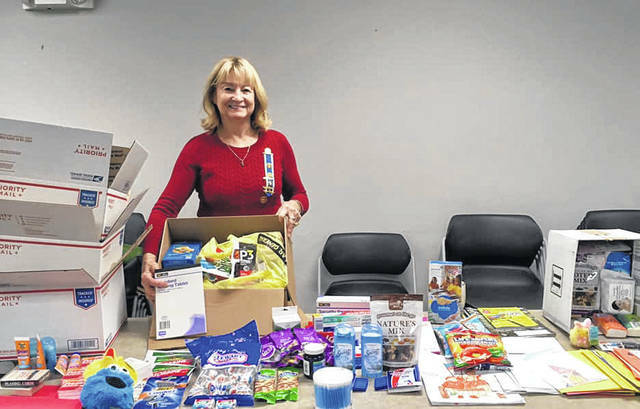 Our local chapter collected enough items to send six care boxes to soldiers with a local connection this month,” said Tillis. https://www.mydailysentinel.com/wp-content/uploads/sites/14/2019/03/web1_3.29-DAR-1_ne2019328141831483.jpgReturn Jonathan Meigs Chapter Regent Gina Tillis presents a certificate of appreciation to Tyler Eblin, President of Friends of Rutland. 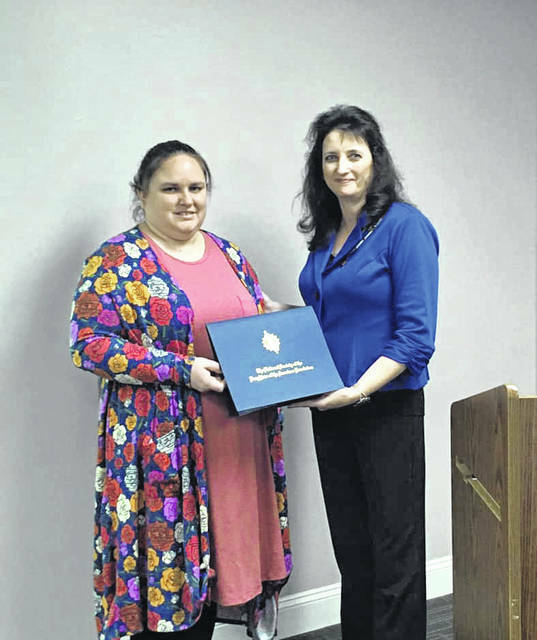 https://www.mydailysentinel.com/wp-content/uploads/sites/14/2019/03/web1_3.29-DAR-2_ne201932814183311.jpgReturn Jonathan Meigs Chapter Regent Gina Tillis presents a certificate of appreciation to Sarah Hawley, managing editor of The Daily Sentinel. https://www.mydailysentinel.com/wp-content/uploads/sites/14/2019/03/web1_3.29-DAR-3_ne2019328141834365.jpgThe program for the March meeting was presented by Rebecca Karason from Huntington National Bank talking about energy conservation. https://www.mydailysentinel.com/wp-content/uploads/sites/14/2019/03/web1_3.29-DAR-4_ne2019328141835539.jpgOpal Grueser is pictured with items which are part of the group’s project to send boxes to service members.